Christian Yelich was not thrilled after back-to-back hitless games. The Milwaukee Brewers outfielder wanted so badly to get back on track that he spent an hour hitting underhanded tosses in an empty stadium more than four hours before first pitch. 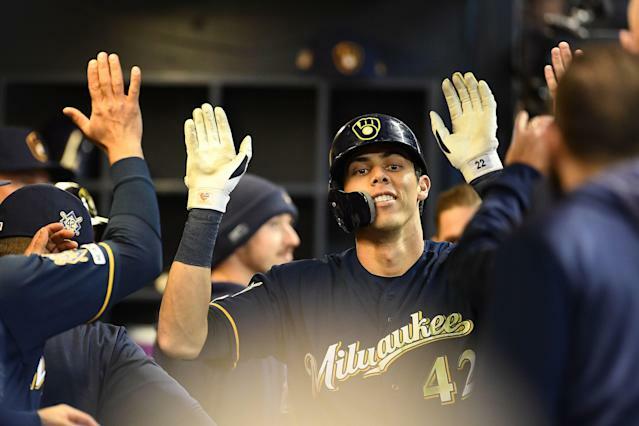 Whatever issues he might have had with his swing were clearly solved because by the end of the night, Yelich had hit a career-high three home runs in a 10-7 rout of the St. Louis Cardinals. After a first-inning lineout, Yelich turned things around in a hurry by crushing Dakota Hudson’s sinker down the heart of the plate over the left-center fence for his sixth homer of the year. The opposite-field blast was shot out of a cannon at 114.1 mph, which is likely the hardest-hit ball of his career. His previous best since Statcast was implemented in 2015 was a double at 113.6 mph last year. After the Cardinals stormed back to tie the game at 6 in the sixth, Yelich retook the lead with his second homer of the game in the bottom of the frame. He turned on reliever Mike Mayers’s high fastball and sent a moonshot into the second deck in right field. Yelich capped off his day with another opposite-field homer in the eighth inning, this time off John Brebbia. His final home run gave him a franchise-record seven RBIs on the game, and he became the 15th Brewer to hit three homers in a game. Can Christian Yelich improve on his MVP season? Last season seemed like it might be a career year for Yelich when he won the NL MVP and hit a career-high 36 homers. But he might actually be out-doing himself in 2019. Yelich famously started the season by homering in four straight games, and he’s hardly slowed down since. Although it’s been only 17 games, Yelich is hitting an astounding .354/.449/.785 with as many walks as strikeouts. Yelich was able to hit so many home runs last year in part because an astounding 35 percent of his fly balls left the yard, by far the most in baseball. But now he may not even need that kind of luck because he’s elevating the ball more and hitting the ball on the ground less than half the time for the first time in his career. With more balls hit in the air — and he’s still crushing them — Yelich is on his way to another career season.